The Friday before Memorial Day was for the fair! Here are the boys helping plant the half wine barrel for the fund raising auction on Saturday (caution: bad cell phone photo!). 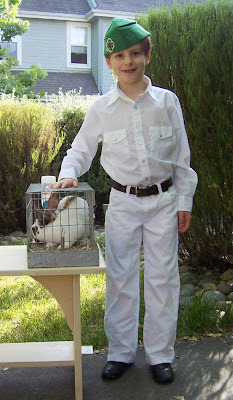 And here is Boy with Rabbit: #1 Son in his 4H garb (minus tie) with Dart, getting ready to go to the fair for the Primary judging. Of course, I had to stop by and check out the sheep. Here's one that was checking me out a little too close! Tomorrow: the auction! A little hint about that cake I mentioned yesterday...it went for 4 figures! Bwah! 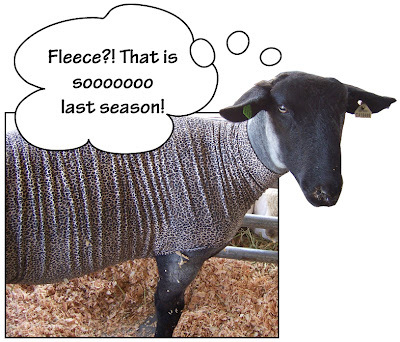 Very stylin' sheep, indeed! It seems like it was a blast. Congrats to your son (and Dart) on their first show! Of course Dart is a show rabbit with such natural good looks! Congrats to your son! 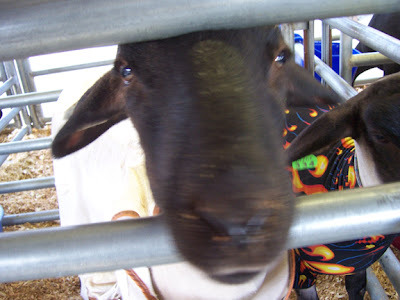 Maybe by next year, he'll have a sheep and a pygmy goat! Did the cake have gold leaf and maybe a diamond or two? 4 figures?!? Must be some cake alright. 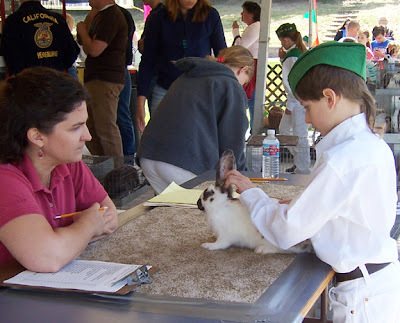 The bunny is definitely a Blue Ribbon candidate in my book -- the kids, too! Looks like you all had a ball. Those boys are getting big.Dart is a lovely rabbit. I can't eat rabbit either, they are way cute. Love the way their noses wrinkle and twitch. Hey, your big boy did well. He didn't even look nervous.Terrific showing for both of them. Best picture has to go to you catching that sheep checking you out! What a face. Priceless. You are a great photographer. I am glad you had such a great time. I loved hanging out with you during the awards ceremony. Maybe next year we will spring for a pig. Bacon, anyone? PS: the boys are as darling as ever, and Dart is a fine looking bunny! Oh great - looks like you had a blast that weekend! Love the pics! 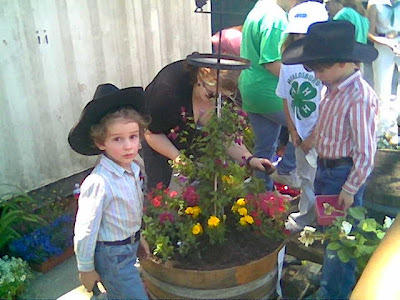 Cute lil' 4-h guys! Looks like fun, I just love the stylin' sheep, too. Your boys are adorable. Dart is great too. I've never eaten rabbit. You know how everyone says it tastes like chicken? Then why not just eat chicken? Bunnies are too cute! I do occasionally eat -(whispers) lamb. Great pics. I'm sure you are so proud of your son, he looks like a good kiddo. Good for Boy & the rabbit...that's so cool. You didn't fondle the sheep, did you? ?